What make you different from other photographers? I speak fluent English, Cantonese and Mandarin, meaning that I will be able to communicate easily with you and your guests regardless of cultural background. Yes, ABSOLUTELY! 100%. For sure. Yes! I have been a huge NIKON fans since I was fifteen years old. All my gear is top-of-the-line professional Nikon equipment and I have extensive backups. How many hours can you cover? The full-day package covers up to ten hours. I believe that every wedding runs differently, so I will make myself available according to your needs. I am also available for pre-wedding preparations, capturing your day from the beginning right up to the big moment. I understand the wish for a pre-established price, but naturally each wedding is unique, with different locations and packages. 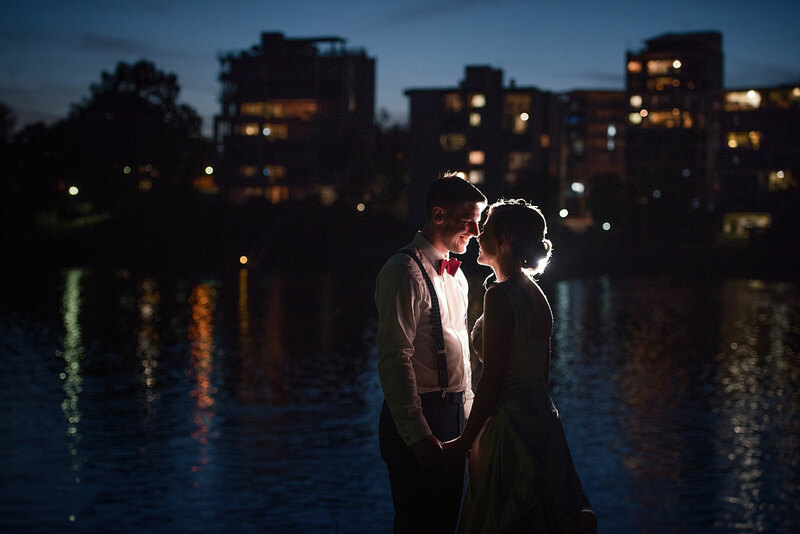 Weddings that are 50km away from Brisbane, the Gold Coast and the Sunshine Coast require travel, which does not need to be included in a local wedding rate. Destination weddings are different again. However, I can give you a rough idea. A small wedding package with prints starts at $1950 and the full-day package starts at $2950. I am more than happy to create custom wedding photography packages to suit my clients. Simply drop me an email and make an appointment. I would love to meet you and your partner in my comfortable studio and discuss your wedding plan. When will you start in the morning? It depends on how big your bridal party is and whether or not you would like to have photos for the boys. The earliest time I can start your wedding photography is 10am. There is an old saying that rain on your wedding day symbolises fertility, cleansing and good luck. Photos on a rainy day can be beautiful, creative and fun. However if the rain is torrential and I can only take photos indoors, I am happy to offer a post-wedding shoot for you. What if I don’t want posed pictures? This is absolutely understandable and my style actually will suit you very well. I prefer to work in a natural, documentary-based way with minimal guided posing. How many photographers on the day? I will be the main photographer on your wedding day. I took most of the photos you see on my page working alone. However, if you have more than 150 guests I will suggest adding a second photographer. How many locations can we have on our wedding day? There is no location limit within the package coverage. Can we extend longer hours? Yes, definitely! Let’s say you initially book a six-hour wedding photography package and on your wedding day you find you would like to extend it. I will be more than happy to stay longer. The additional rate is $350/hour. Yes, all the photos will be edited individually for colour correction, skin tone and other enhancements. It depends on your wedding package. For a full day wedding, you will usually be presented with about 600–700 edited photographs in high resolution on a USB. Will we receive the raw, unedited files? Unfortunately, no. The raw unedited files aren’t available for viewing or purchase. This would be a bit like asking the chef from a five star restaurant to give you the leftover ingredients used to make your supper! The images selected for editing and final delivery reflect my very high standards. Will you come to our wedding rehearsal? I usually do the location check a couple of weeks before the wedding day if I am not familiar with the venue. If the venue is outside of Brisbane, I normally arrive an hour before the wedding on the day. If you would like to invite me to your rehearsal on a particular date, I will add it to your package. Otherwise I will not attend the rehearsal. How long does it take for us to receive our photographs and products? Roughly 6-8 weeks after your wedding you will be invited to my studio to view your photographs and collect your USB. Upon final approval of your album design and any wall prints you request, most products are ready for delivery within twelve weeks. What will my album look like once it’s completed? It will be a clean, fresh, modern leather album, just like a coffee table book you’d buy at a bookshop. With a customised, contemporary design, your wedding album will be a unique and special family book that will be an heirloom for future generations. I have a few different finished album options in my studio so you can choose one that is just right for you! Do we have to pay for extra pages/spreads? There are sixteen pages included with each album. You certainly can order extra spreads to fit more photos from your wedding day, at a rate of $85 per extra page. Or to save more, you can simply upgrade your album package. Can I just have digital photos without any prints or album? All my packages include digital negatives and an album. I believe you hire a professional wedding photographer for professional services and high quality products. I would love to help you to organise your album and wall prints. All my products are made by high-quality manufacturers. What is available for our parents? The parent album is a wonderful keepsake. It is $350. An online gallery is a private, password-protected section on my website where all of your wedding photographs will be uploaded for you and your family and friends to view on request. Online galleries remain active for thirty days after your reveal session. Once the gallery has been closed there will be a $25 fee to upload it for an additional seven days. Yes, I do! Please take note that most engagement sessions need to be planned as weekdays because of the heavy wedding schedule on weekends, but there is occasionally a Friday or Sunday available. Sessions are photographed within Brisbane. I’m available to travel elsewhere for your engagement session by arrangement. Do you offer wedding photography and videography combo packages? Yes, I do! Alex is award-winning wedding videographer. We provide high quality photography and videography combination package together. Check out our cinema page here. Do you offer wedding photography and photo booth combo packages? Yes, I do! Happy fun booth is an open-air-style photo booth which fit easily into any space. A booking fee/retainer of approximately 50% is required to reserve your date. The remainder is due one month prior to your wedding. I’ll send you an email reminder when your final payment is due. I like to help you have a relaxed day so you don’t have to worry too much and just enjoy your special moment. Do you have payment plan arrangement? Yes, I have three-months, six-months and twelve-months interest free payment plans for wedding albums and wall prints. Please ask if you would like to know more about ways I can make my services affordable for you. Feel free to contact me by sending an email to book@twinlotusproduction.com if you have any questions, or would like to design your own custom wedding package.